I have another exciting announcement today, I will be hosting a plus size pop-up shop with the beautiful ladies from a delicious food/lifestyle blog Fat Girl Food Squad. What does this mean exactly? 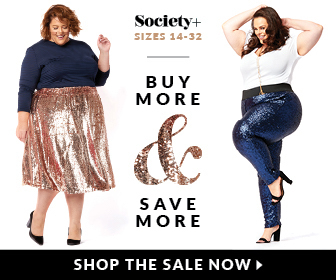 Well… myself and a bunch of other totally awesome plus size girls (listed below) are getting together and selling our gently used and never-been-worn plus size clothing! I have so many clothes, tons with the tags still on, in all sorts of sizes to sell – I don’t know how I going to fit them all in my car! There will also be a plus size vintage clothing dealer at the event as well as two plus size Toronto boutiques selling their merchandise at discounted prices. So if you are free on November 22nd and in the Toronto area pencil this event into your calendar – it will be a lot of fun and you are bound to find a great new outfit for a really great price! Victoria owner of my favourite plus size boutique Gussied Up Plus will be selling amazing finds from her store! Rachel owner of Primaala will be selling beautiful pieces from her high-end boutique which is something you don’t want to miss out on! Hosting us for the day will be Propeller Coffee. This brand new venue space is accessible and across from Lansdowne subway station! The venue which operates daily as a cafe and roastery, will be serving up delicious coffee and tea all day long. The venue space itself though is open, airy and has tons of natural lighting – perfect for a day of clothes shopping! Parked outside the venue we will have Burgatory Food Truck selling their sinfully delicious burgers, should you get hungry at all. Throughout the day, we’ll be giving away prizes and have other goodies to keep you entertained. That is it! It should be am awesome day filled of amazing plus size women, food, clothes and fun! Can’t wait to see you there!